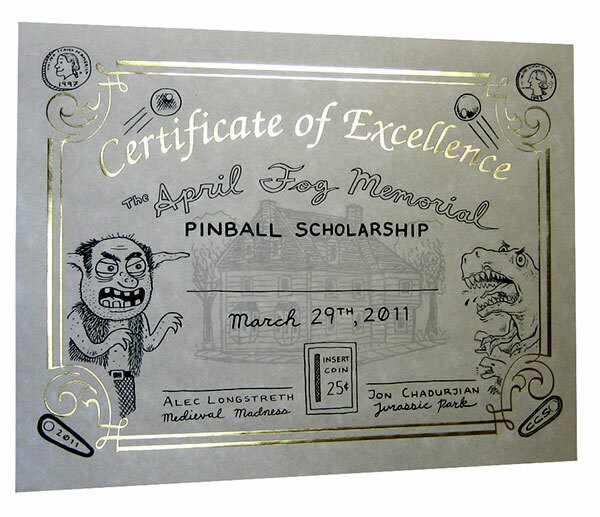 When Jon Chad and I set up our pinball machines in the media room at the Center for Cartoon Studies, we set up a deal with CCS in which 50% of the proceeds would help us pay for our machines and 50% would be donated to the school in the form of The April Fog Memorial Pinball Scholarship (named for the house in which my Medieval Madness machine used to live). Since last June, there have been 2640 games of Medieval Madness played, and since October, 848 games of Jurassic Park! (Those stats DO NOT include games played by me or Jon). Which adds up to $546.00 That is a lot of pinball! Before spring break, the CCS seniors submitted design proposals for their thesis projects, including mock-ups of the finished packaging. During spring break, two alumni (Bryan Stone and Laura Terry) looked through the proposals and selected the best four, based on design and content. Each of the four students will receive 1/4 of the money as photocopies, to help with the printing of their thesis projects. I just wanted to post a quick update about Drop Target issue two. 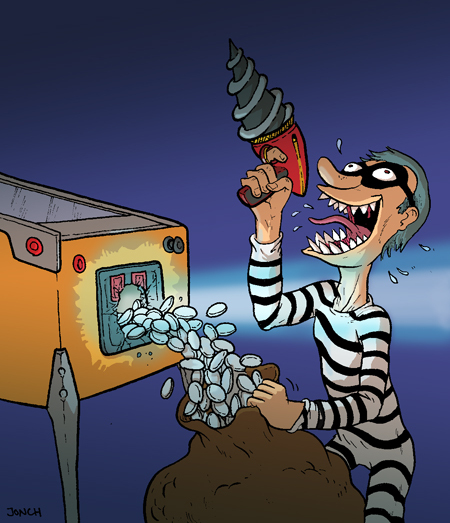 Jon and I are working on it feverishly, and the finished pages are starting to pile up! We've got about 25 in the can already and there are a lot more on the way. We're aiming to have this book done for the MoCCA Arts Fest in New York City, April 9th and 10th. If you live in New York or in the surrounding areas, please swing by and say hello! I will also have copies available at the Stumptown Comics Fest in Portland, Oregon April 16th and 17th. After that we'll put up the online ordering information for everyone else. We'll continue to keep you guys posted about this issue. It's going to be awesome! As Jon mentioned in his last post, his Jurassic Park machine has been on the fritz lately. We have big plans to fix it up over Spring Break (next week!) but lately it has been switched off so that that no unsuspecting student deposits a quarter for a game they can't play. 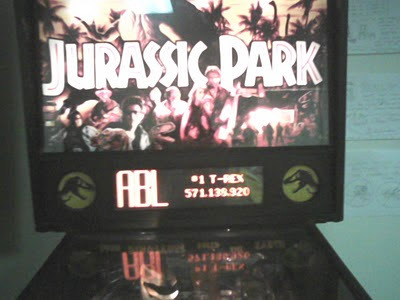 THEN I HAD THE JURASSIC PARK GAME OF MY LIFE. The top scores in Jurassic Park are listed as a series of dinosaurs. #1 is T-Rex, #2 is Velociraptor, etc. The best I have ever done on this machine is to get the #6 score, which is some obscure dinosaur I had never heard of before. And that was for a score around 300,000,000. On ball one, I started Tri-Ball and immediately hit a ramp jackpot shot. Then with all the "CHAOS" targets lit, I cashed in my smart missle to start the chaos 6-ball multiball. With that going I hit all five "CHAOS" targets again, and then I hit the T-Rex to collect the super mega jackpot. Then the ramp was lit up again (more supers? ), and I hit it like 5 or 6 times at least. I glanced up in the middle of this and I had something like 450 million points (?!?!?!) And that was on BALL ONE. I just kept my cool for the rest of the game (got the T-Rex bounty, completed a few modes, got the extra ball, etc.) and ended up with 571,138,920 points! I'll be honest, I think both these images are coming from some sort of deep dark part of my mind that is WAY too sleep deprived. As Alec mentioned in the last post, we are hunkering down here at DTZ HQ working on the next issue. You all are in for a treat! Meanwhile, in the magical world of pinball ownership, my Jurassic Park machine needs some repairs. There's a couple of targets that need lock nuts to tighten them in place, the EOS switch on the right flipper needs to be fit back into place, and there's some other odds and ends. I've been so busy, though, that I haven't given PB (my machine's nickname) the attention he deserves. I'll get to it, though, and SOON! Whoa, ten days without a post? Well, all I can say is that Jon and I are hard at work on Drop Target #2, which we are going to try and have out for MoCCA in early April. 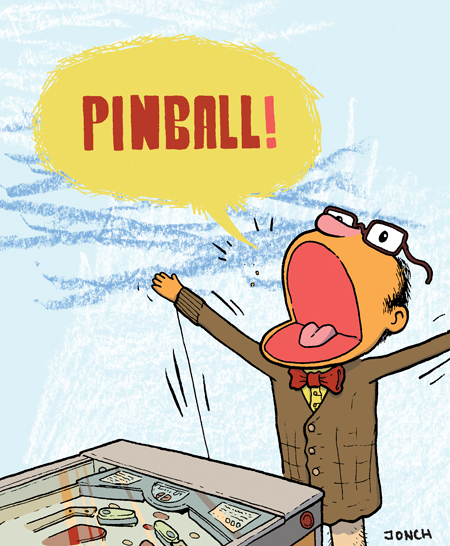 The idea for this segment is to focus on people that are working hard to bring pinball back up to its former glory. Jon and I feel there is so much negativity surrounding pinball these days, we want to focus on people that are trying to bring it back from its so-called "death" instead of bemoaning the public's falling interest. We'll keep everyone posted about issue #2, and please just know that if things are quiet around here, it's only because we're pouring all of our energy into the production of issue #2. I think it's going to be a good one!